Bye bye, Internet Explorer 6. 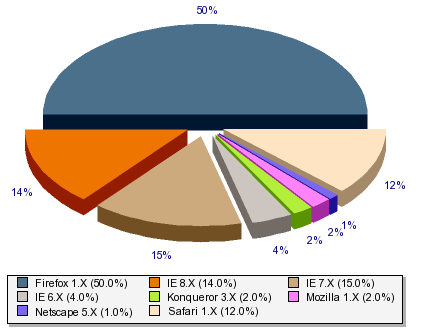 Well, it is more than five years ago that I blogged about the fading away of people using Netscape Navigator 4.x versions to visit my website, a year later about the reduction in people browsing my site with Internet Explorer 5.x and about the first sightings of Internet Explorer 7. Today things are different, and Microsoft’s Internet Explorer 6.x is the beast that keeps me from implementing cleaner HTML code for this website. But there are good news: In the last months, the number of people visiting this site with Internet Explorer 6.x has more and more often been smaller than the number of users browsing the web with the current 8.x incarnation of the beast. This is good news, because the new version 8.x is much more standards compliant and it finally, finally supports the use of the quote tag <q>. That means that more people will acutally see the quotation marks around the quotes (“” for English, „“ for German) that I coded into this blog and the other pages offered here. When the amount of IE 6.x users consistently remains below three percent, I will kick out the hacks that I put into the code to work around IE 6.x’s annoyances. Maybe that will also be the day when I will introduce the first pages that are coded in HTML 5, something that I am really looking forward to because the new <video> element will make embedding video in a standards conformant way much easier. Yesterday, I made my first direct contribution to the Mozilla Project, the organization that programs and distributes my favorite browsers, Camino for Mac OS X, and Firefox for most other platforms (AOL‘s Netscape is also built upon the Mozilla sourcecode). I would have liked to contribute to this great open source project earlier, however, a lack of resources and programming skills made this difficult. Therefore I have so far only contributed by posting in related forums, voting for bugs that bugged my in particular, and generally spreading the word. Yesterday however, I was again annoyed by one of the quirks that sometimes make you frustrated – in this case is was the non-standard way of Camino’s bookmark export function. A vote for fixing this seemed to be in order. To my surprise several searches in the Mozilla’s bug database bugzilla (yes, I know) turned out nothing. After some gnawing of fingernails I decided to take the plunge and write my first bug report. It is Bug 304118 – improve export of menu spacer / bookmark separator. I was crossing my fingers hoping not be told that this is an old hat, see bug number blablbabla. Seems my fears were unjustified: the bug was acknowledged (thanks Jasper!) and, to my utter astonishment, a fix has already been submitted! Extensions: You can customize your Firefox to block ads, to use mouse gestures, to better code your website, and much more. Searching: You can easily extend the search field in Firefox’s toolbar. Just click at the Google G in the search field in the upper right corner and click the lowermost entry to add other search engines. I enjoy accessing dictionary.com, the wikipedia and the leo.org dictionary in that way. If you are a mac user and do not heavily use extensions in Firefox, I recommend trying out a recent Camino nightly build, which is better suited to Mac OS X – it’s really sleek! That was quite a bit of work. A few minutes ago I put the new official website of my post-graduate college online. Take a look – I hope you like it. If have a moment of spare time you could check the site with different browsers and tell me if you encounter particular problems. One disclaimer: the layout does not work well with 4.x versions of Netscape. I would recommend updating to a browser using the Gecko engine, i.e. a Mozilla related browser. New homepage for the Graduiertenkolleg. A test page will go online in a few days, I would appreciate any feedback then. You probably won’t notice any differences, but everything is much better now. ;-) The blog displays exactly as it should in a ton of different browsers: Internet Explorer 5.0 on Win98, 6.0 on WinXP, 5.23 on MacOS X, several different Mozilla/Firebird/Camino builds on different platforms, Opera 6.02, and Safari (which uses a tweaked version of the rendering engine of Konqueror on Linux). Only the trusty iCab has it’s usual problems with the correct rendering of pretty basic CSS code. But the page still works nicely even in iCab.